If you die cast or fabricate parts from strip metal and you don't know about DEL CEGNO THREADING, it may be costing your company money. On Thin-Walled components we TRI-ROLL threads, knurls, splines, stamps, serrations and special forms for customers who find these operations problematical. 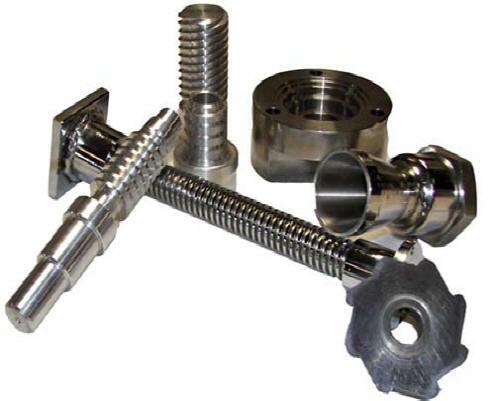 An extensive selection of die heads and tapping fixtures are available to meet any threading machine requirement. We are capable of producing both standard and special threads. To maximize production levels and minimize the human factor we design, build and implement our own robotic feeding systems on a battery of 15 TRI-ROLL machines. we also produce our own form and thread rolls. These unique capabilities place in the realm of low cost high-volume commercial production and facilitates response for quotes and collaboration toward new product development. As we are not a primary operation, all parts are provided by customers who attain a competitive edge by utilizing our service which also includes precision thread grinding and thread rolling to aeronautical specifications. We stand ready to accept any challenge and invite all inquiries or personal inspection. Copyright © 2008 DEL CEGNO THREADING COMPANY. All Rights Reserved.